Warning: the above video is going to make you envious and may inspire hardware upgrades. This video from MacRumors shows a top of the line build of the latest iMac 27″, upgraded with a 3.4GHz Quad-Core i7 CPU, 16GB of RAM, and a 256GB SSD launching all of its apps in a freakishly small amount of time. According to MacWorld, this is the fastest Mac that has ever been shipped when tested on individual application tasks, whether it’s encoding MP3’s, handling Photoshop filters, or just importing movies and photos. What’s a speed demon like this going to cost you? $3399 as a build to order option from the online Apple Store. That’s taking the top of the line base model ($1999), upgrading the CPU to an i7 ($200), maxing out the ram ($600), upgrading to a 256GB SSD ($500), and finally, jumping up to the best possible video card – the AMD Radeon HD 6970M with 2GB of VRAM for another $100. That’s not cheap, but when you consider that you get a beautiful 27″ LCD with that price, it comes out to a pretty good deal when compared to the starting Mac Pro price point of $2499. Obviously the complete package is what makes this such a monster, but any Mac user can get speed increases from RAM upgrades and an SSD drive. If you use a ton of apps, you’ll see a nice performance boost if you upgrade to 8GB of RAM, but if you want to feel pure speed when doing everyday tasks and launching apps, you can’t beat the immediacy of an SSD. RAM upgrades have gotten really cheap , and SSD’s are coming down in price as well, and the cost of upgrading your current Mac is just a small fraction of that $3399 iMac. 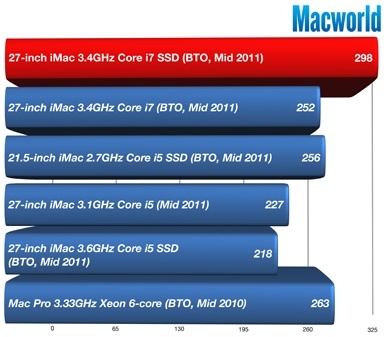 The iMac is moving closer and closer to a pro level machine and I don’t mind that at all. If only I had an extra $3500 burning a hole in my wallet, I would get one myself. in the paragraph below the pic, “upgrading to a 256MB SSD ($500)” 256MB SSD?? Wow, I want one, no more spinning beach ball.